This is a very decadent, filling S dessert for Trim Healthy Mamas that requires no special ingredients and takes only 5 minutes to prepare (plus refrigeration). All you need is a can of coconut milk, some natural peanut butter, dark chocolate, a plan-approved sweetener (I use xylitol, but you can also use half the amount in Gentle Sweet), a little vanilla, and a pinch of sea salt. Gluten-free, sugar-free, and dairy-free (if you leave off the whipped cream topping), this thick, fudge-like Peanut Butter Cup pudding tastes like a Reese melted in your mouth! THM S. No special ingredients. 1 can of coconut milk (14 oz). In a saucepan, bring coconut milk and sweetener to a boil. Remove from heat and immediately whisk in remaining ingredients until smooth. 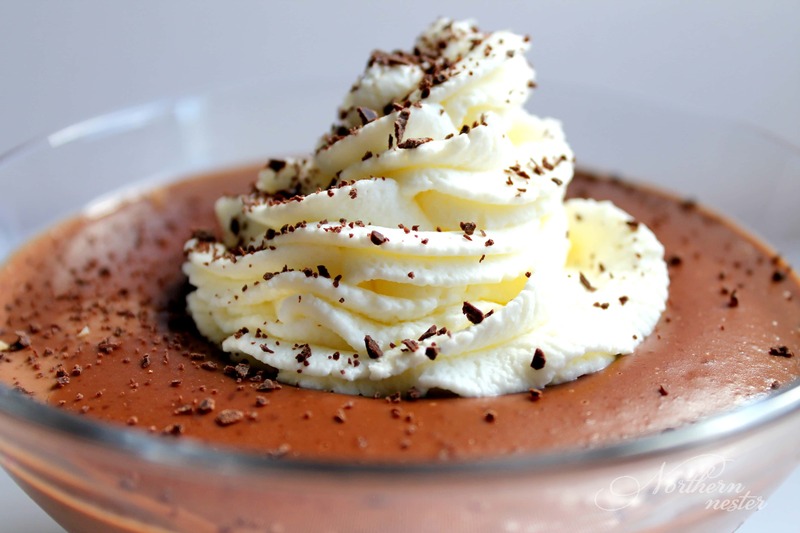 Pour pudding into dessert dishes, refrigerator, uncovered, for 4 hours. OPTIONAL: Garnish with naturally sweetened whipped cream and grated chocolate. How many servings does this make? Looks delicious. It makes 4-6 servings, depending on if you top with whipped cream (which I think is a must!). 6 servings with whipped cream on top. ???? How much stevia would you suggest to use instead of the xylitol? I would start with a teaspoon and adjust to taste. I only have 100% unsweetened chocolate. How could i convert that? Just add more sweetener? What kind of 85% chocolate do you use? Hi Kristine, yes, just add more sweetener if you’re using 100% unsweetened chocolate. I’d try 4 Tbs of xylitol and see how that tastes. I use either Lindt’s, Laura Secord, President’s Choice or Green & Black’s 85%. This was delicious and SOOOOO easy to do!! I had one for breakfast and the others as snacks/treats. However, I had a little issue with it separating, when I was dividing it out in my containers I noticed there was standing liquid (coconut milk) which later solidified in the fridge. When I pulled it out the next day I had to mix it up to get rid of the white layer on top. Did this happen to you too, or did I do something wrong?? Hi Heather, Did you cover your pudding, by any chance? Sometimes when the condensation drips off of the cover, it makes thin white-ish marks on top of the pudding. They’re harmless, so you did the right thing by just stirring it in. Other than that, I haven’t had an issues with separating. Hope that helps! I didn’t cover it, I noticed it was separating as I was putting it in it’s containers. I put them in the fridge without a cover and after they were cold I put the cover on – and they were already white on top. It wasn’t a biggie really, I was concerned I did a step wrong or something. I’m going to make them again tonight, but instead of using Peanut butter (I love PB, my friend doesn’t so I’m making her something she’ll like) I’m going to add unsweetened coconut flakes 🙂 Hopefully it’ll turn out great too! This looks delicious! I will be making it this week! Thanks for the awesome recipe! Thank you, Sarah! That means a lot, coming from a THM guru like yourself! Would you recommend gentle sweet or super sweet as working better if I don’t have any straight xylitol? Thanks! I would use half the amount in Gentle Sweet. It has less of an aftertaste than Super Sweet. I love this recipe! I have made it many times. Right now I am trying to find out if I have a sensitivity to peanuts. Do you think I could substitute cashew butter or almond butter for the peanut butter? Have you ever tried that or heard of it? How can I save this recipe on Pinterest? If you hover over an image, a “pin it” button should appear in the top left hand corner. Almond milk is too thin for this recipe. It’s the thick part of the canned coconut milk that helps to give this pudding its consistency. I made this today…tastes just like the peanut butter cups,! Had no issues at all with it. Yummmm! can you eat this warm instead? Oh yes, you sure can! I always get a few bites before it makes it to the fridge…I have never tried reheating though. Can’t imagine that would work too well. I made this as a half recipe, because puddings are hit or miss at our house. One bite and I realized I hadn’t made nearly enough! Thank you, Jacinda! Love the flavor of this pudding but it is too thin- more liquid than pudding. Any suggestions? How much of this can you eat for a meal? like 1/2 cup or maybe more?